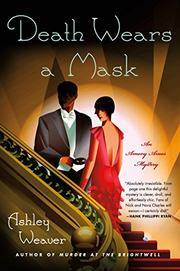 A second murder investigation is in the cards for a 1930s society couple. Now that the Ames' rocky relationship has been further strained by Armory's having suspected her husband, Milo, of murder (Murder at Brightwell, 2014), the couple has gone home to London, where things have improved for them. When they attend a dinner party at the home of the Barringtons, they meet a diverse group of people who suddenly intrude into their lives as suspects in several robberies. Mrs. Barrington confides in Armory that she believes one of her guests has been stealing her jewelry and comes up with a plan to trap the thief at a masked ball Lord Dunmore will be throwing the following night. The trap is baited with a paste sapphire bracelet, but disaster strikes when James Harker, Mr. Barrington’s nephew, is found shot dead with some of the jewels in his pocket. Unfortunately, Milo, who begged off attending the ball with his wife in order to buy a horse, turns up with a French actress, and a picture of them kissing shows up in a scandal magazine. Armory is determined to solve the mystery even before the police, in the form of an inspector she met in the Brightwell case, ask for her help. Despite remaining deeply in love with Milo, who insists that the latest episode is all a misunderstanding, she also contemplates divorce. Clearly, this dangerous adventure will either bring them closer or put paid to their marriage. Fans with fond memories of Georgette Heyer’s mysteries set in the same period will be delighted with the gallery of suspects and the edgy romance.